Kay Granger is the Congresswoman for the 12th District of Texas. 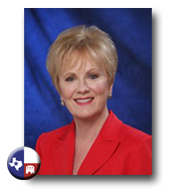 She is the only Republican woman from Texas to serve in the U.S. House of Representatives. Long active in local, state and national government as well as civic affairs, Congresswoman Granger is recognized for her energetic and sensible leadership. Congresswoman Granger was selected to serve as the Ranking Member of the appropriations subcommittee on State-Foreign Operations for the 111th Congress. Her selection makes her the highest ranking Republican on the subcommittee. During the 110th Congress, she served as Vice Chair of the House Republican Conference. In that role, she acted as a spokesperson for the party. Congresswoman Granger stepped into a national leadership role in the war on terrorism based on her work with Iraqi women. She is co-chair of the Iraqi Women’s Caucus. In the course of three congressional delegation visits over two years to the Middle East, she worked with and mentored Iraqi women who now either hold elected positions or are leaders in their communities. In addition to her role as Ranking Member, she serves on the Defense Appropriations Subcommittee. Granger co-chairs the Anti-Terrorism Caucus and serves as a deputy whip. Congresswoman Granger received Secretary of Defense Donald Rumsfeld’s first Global War on Terrorism Coin for her unwavering support of anti-terrorist efforts, the 2006 National Association of Community Health Centers Community Health Defender Award and the National Association of Manufacturers Award for her pro-growth, pro-manufacturing, pro-worker voting record. She has been inducted into the Texas Women’s Hall of Fame and the Fort Worth Business Hall of Fame and is the recipient of the Fort Worth and Tarrant County Region of the National Conference of Community and Justice’s 2006 Brotherhood/Sisterhood Citation. Congresswoman Granger is a published author. Her book, “What’s Right About America,” praises American values and how we live out those values. Kay Granger currently lives in Fort Worth, TX. You can go here for more of Kay Granger’s biography.